Imagination - What the Funnel? The funnel has been the standard for decades, but the always-on 24/7 cycle calls for a new marketing model. The funnel has long served as our content marketing GPS. It guides how agencies and brands create, distribute and measure results-driven program strategies. But is the venerable marketing model invented in 1898 still relevant in our always-on, omni-channel world? Does its systematic tracking of consumer journeys through the classic four stages of AIDA—awareness, interest, desire and action—accurately reflect how we make purchasing decisions today? Not really. That’s why in the last 10 years, brands and agencies have regularly updated the funnel with new stages like consideration, influence and post-purchase evangelism. Super-catchy, right? These tweaks did the trick for a while. But last year, academics at Northwestern University’s Medill School of Journalism, Media, Integrated Marketing Communications in Evanston, Illinois, put forth a bold new framework with fascinating implications for content marketers. Funnel, meet the consumer engagement engine. The engine is meant to explain the way consumers engage with brands today, explains Tom Collinger, executive director, Medill IMC Spiegel Digital and Database Research Center. The engine shows five gears that move independently but are ultimately interlocked. 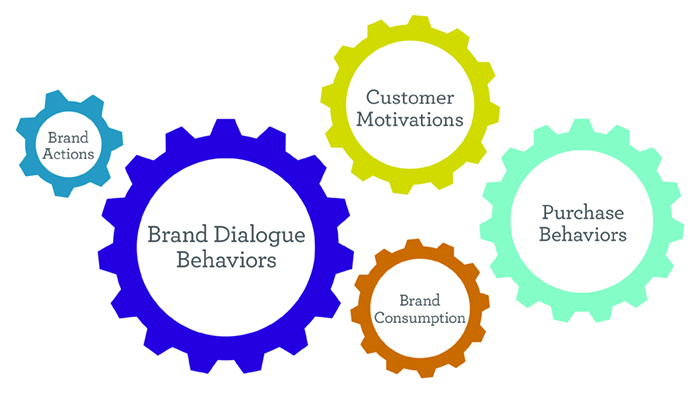 They’re called brand dialogue behaviors, purchase behaviors, customer motivations, brand consumption and brand actions—and they’re always happening and influencing our decisions. The smallest gear, brand actions, is the main thing brands made and marketers measured in the good ole days: marketing and advertising programs. But, now, the largest, brand dialogue behaviors, reigns in our digital age. This gear depicts the influential role others’ opinions have on our purchasing decisions. “Most vitally, these are informed by customer experiences with the brand—good, bad or in between,” says Collinger. "It’s a dynamic where it’s always in motion. So if I change my motivation, everything changes. If I change my purchase consumption experience, everything changes." “It radically challenges an enterprise and a brand to understand their new role in the marketing ecosystem, while all of these conversations are going on without them,” says Collinger. “It’s no longer enough to do a content strategy that is a one-way push. It now requires a content strategy that includes a responsive, reactive, strategic approach that engages in time and in language that is consistent with what the market is saying. And, it demands a listening strategy in real time. This, in turn, impacts how we measure content marketing programs. We accept your challenge, Professor Collinger and Medill Spiegel Research Center! The consumer engagement engine is plugged in and revved up. Content marketers, it’s on us to figure out how to sync it to the funnel and put their combined power-packing one-two punch to work. For the research driving the consumer engagement engine, download the report.